Watkins Glen, NY. I'm always a little amazed, not only by the beauty of the gorge itself, but by the skill and scope of the stonework that allows the access most of us take for granted now. Regional landscape architect Herbert Blanche said in 1933 that “the best executed project is one that is least apparent in the landscape,” and after the disastrous flood of 1935 washed out most of the existing concrete stairs and metal railings, the gorge trail was reconstructed with native stone. Its striated, flowing walls are an artful extension of the gorge’s own; often, it’s hard to tell where nature’s work ends, masonry begins. 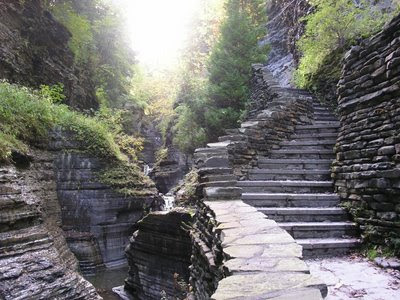 I’ve great respect for the masons who built, who continue to maintain and improve the winding steps, bridges, miles of walkways throughout the Fingerlakes gorges and parks.